We are seeing this more and more, Customers purchase the lovely Balinese style furniture and place it on their carpeted areas in bedrooms or theatre rooms, only to find when the move house or rearrange the room they find these orange dots or stains left from legs or feet of the furniture. 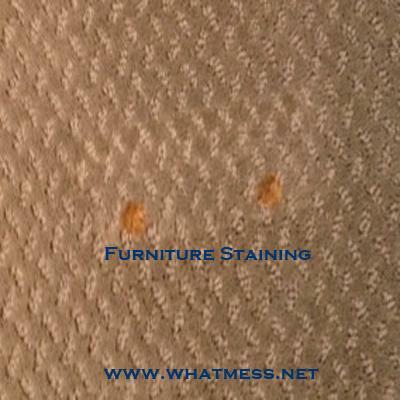 A few things can cause this: The carpet was damp or has been wet around the furniture, and the moisture was drawn up the furniture legs, causing the furniture oil/stain to bleed out on to the carpet. (This cannot be reversed). Tip: Place small plastic pads under the feet or legs of the furniture, or even shopping bags until the carpet is 100% dry.